First off, I'd like to give my sincere apolgies to the makers of the mini-series The Phantom when I said it would be horrible. I was wrong. It was just boring. The SyFy television mini-series, based on the iconic Lee Falk comic strip "The Phantom", clocked in at a drudging four hours long. Most of this time was spent setting up characters and conflict in the typical "Heros Journey." Kit Walker (Ryan Carnes) lives an unimpressive life until he is approached by a group that tell him he is the adopted son of a legendary hero from Africa known as "The Phantom" or "The Ghost Who Walks." They train him, equip him and he becomes a better person. There's nothing ground-breaking, or even original here, so they could have cut this part to a half-hour. 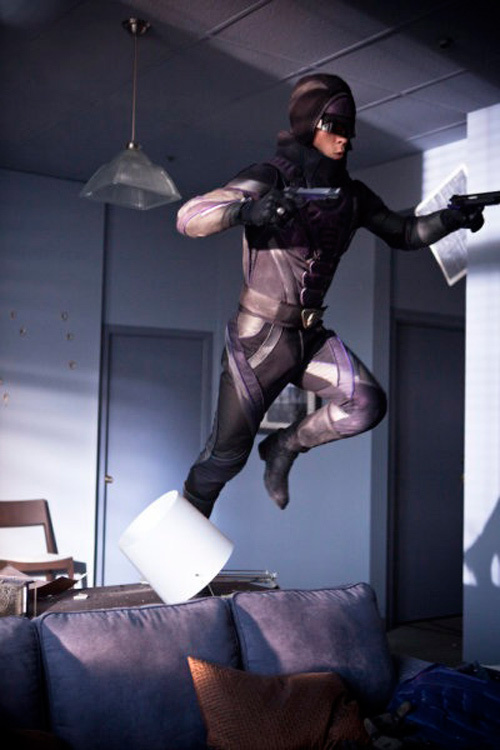 The infamous costume is introduced by mocking the classic Spandex purple costume and diamond mask and introducing the new one which looks like an armor plated hoodie. It got a lot of laughs when it was posted online, but onscreen it looks ok. The biggest problem is its indestructable. To build tension, its important to feel like the hero is in danger. In the Batman movies he has a bullet-proof suit, but he still feels pain or falls down. The new Phantom "hoodie", on the other hand, allows Kitt to walk through a hail of bullets without flinching. Not too exciting. He sets out to stop the evil Singh Brotherhood, led by psychopathic Raatib Singh (Cas Anvar). On his first mission, he fights a bad guy who accidentally falls to his death. Its repeatedly said that "The Phantom" does not kill. But, for the rest of the movie, he uses two handguns powerful enough to literally blow guys across the room. I'm not sure what the point was of introducing a morallity to the character they didn't intend to follow-thru on. The acting is OK, considering the material. The special effects are adequate, but nothing ground-breaking. The evil plan of brain-washing innocent people through their cable box to become assassins could have been epic, but, instead, felt limited. The romantic subplot with Renny Davidson (Cameron Goodman) was the typical "they're in love because he's a man and she's a woman." No other real reason is given. The Phantom has a hero that lacks enough flaws or risk to be interesting and a plot that was too limited to be exciting. It might work as a series, but, as a stand-alone movie, it gets a 34% on the "Geek-Out-Meter."